I have a whole bunch of recent eats to talk about today but before we get to that, I have to tell you something so funny. Well, at least I think it’s funny. So the weather is finally turning colder here in New York. We went from 70 degrees on Monday down to real chilly fall weather. It was beautiful for my run yesterday morning! 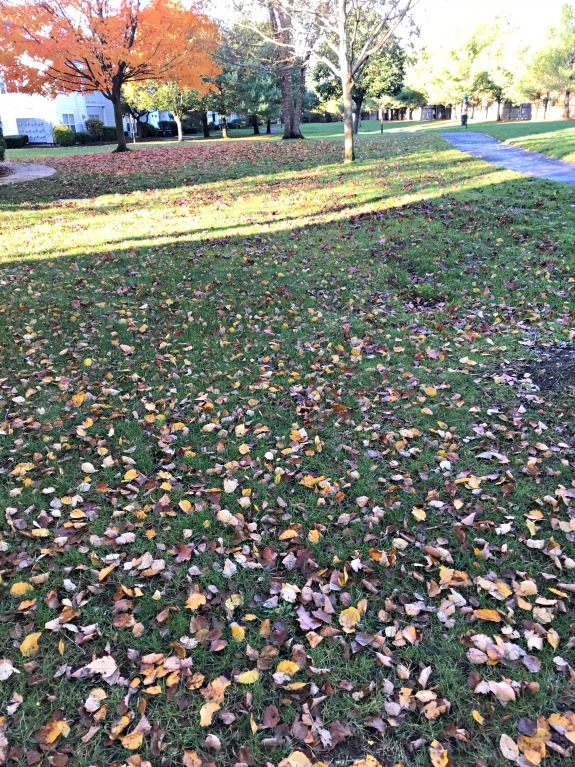 Nice and crisp, in the low 40’s. Before heading outside, I kept thinking about how I really need to go through my cold weather running gear as I don’t remember what I have to wear and I KNOW that I really need to get myself a new running vest for this time of year. Like I keep mentally putting it off but it’s time to buy it! Then I go into my closet, open the drawer to dig out my warmer stuff and then notice that I had in fact bought this GapFit running vest last winter! HA. It was literally hanging in my closet. It’s bright yellow. How did I not notice the vest there this entire time AND how did I completely forget that I wore it last winter? Am I the only one who finds this funny? Same breakfast, before and after my run. 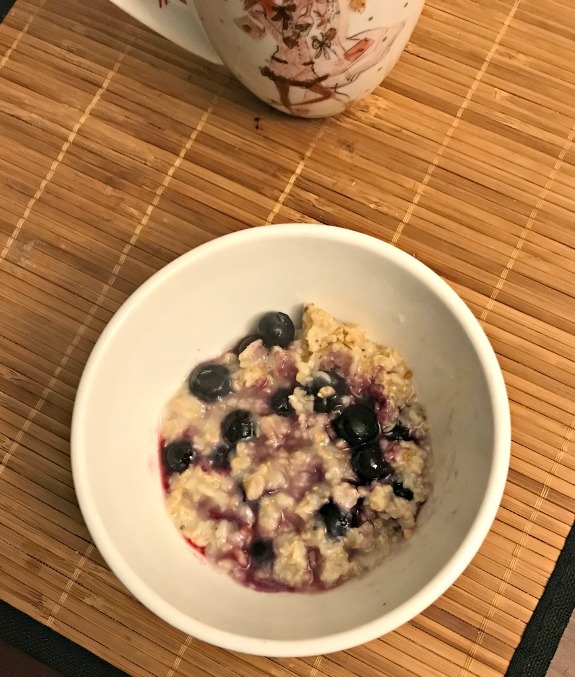 It’s so very rare that I get tired of oatmeal for breakfast! One day, I went with a You Pick Two option and chose the half mediterranean veggie sandwich with half a salad. The mediterranean veggie sandwich was always a favorite of mine. Ask my son about it, he used to order for it in broken baby English when he was two years old. It was the cutest thing. My mommy will have the mediterranean veggie on ciabatta bread. I forgot I used to order this sandwich on ciabatta bread! 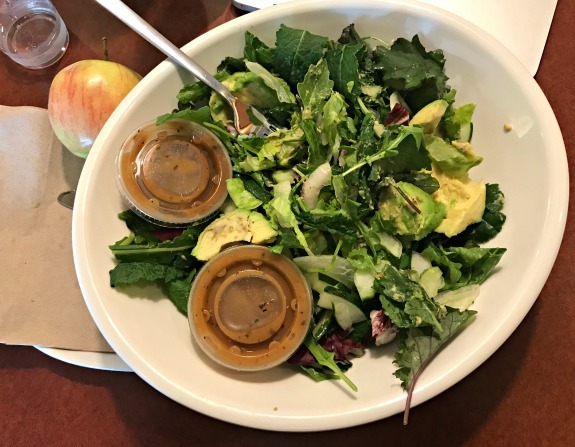 Another day at Panera, I ordered my usual salad. I’m sort of back to making big salads at home again. 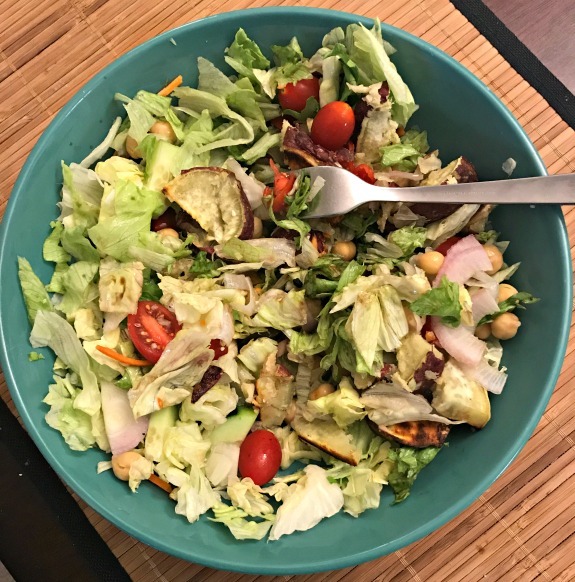 This salad was made with basic salad ingredients and chick peas but also included roasted Japanese sweet potatoes which were definitely the highlight! When I have the Japanese sweet potatoes in the house, I eat at least one a day. 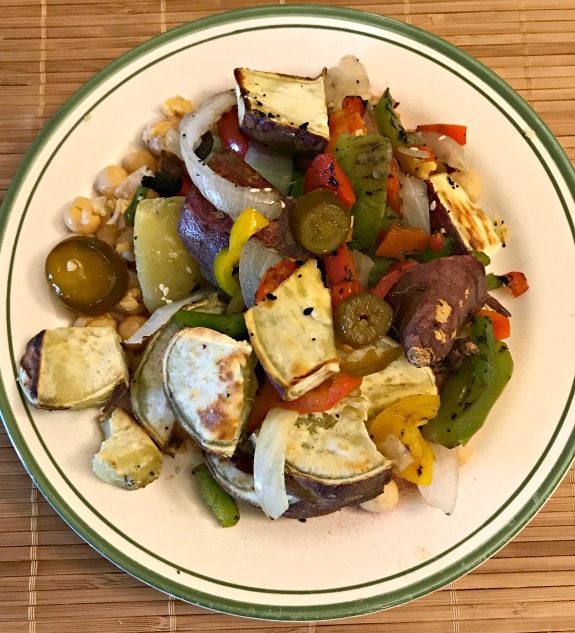 I roasted the sweet potatoes for dinner the other night in the everything but the bagel sesame seasoning and then piled them together with chick peas and other vegetables. Mexican is becoming one of my most favorite cuisines when we go out to eat. I ordered vegetable fajitas twice recently at two different Mexican restaurants. 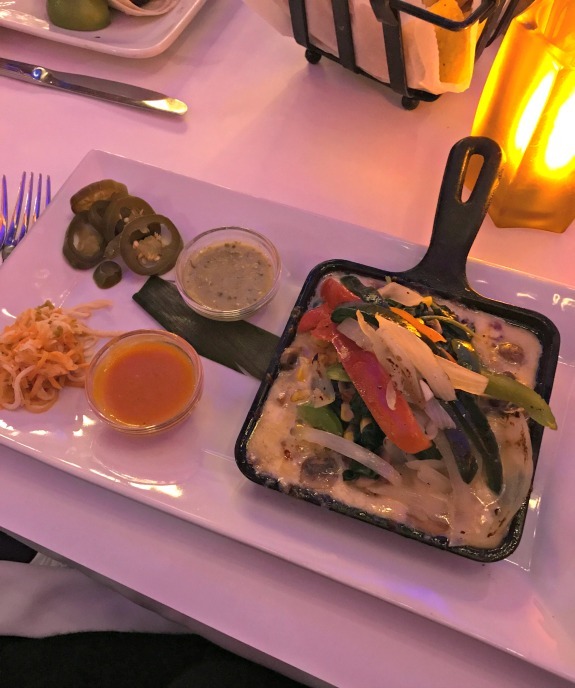 This picture only captured the sizzling plate of vegetables rather than the plates that contained the rice, beans, guacamole and tortillas. Fajitas are so fun to order, right? 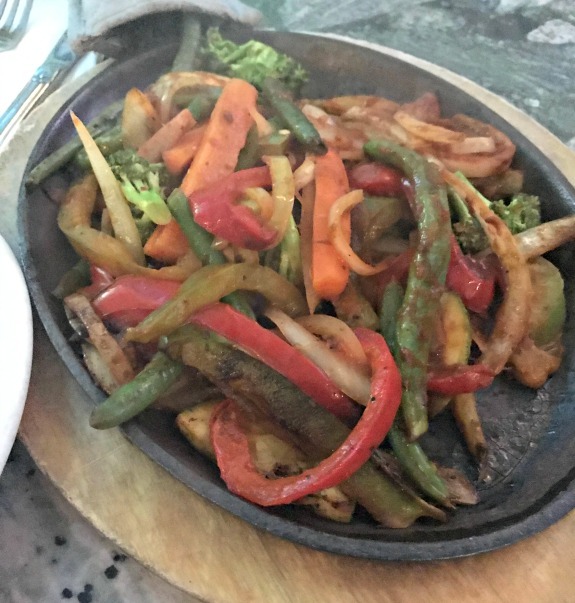 Then there was this plate of vegetable fajitas that I ordered at another Mexican restaurant which were very different from the traditional vegetable fajitas! The vegetables were in a pan with cheese which is not something I typically encounter! I am not a huge lover of cheese but I didn’t send it back. It was good, I just picked around a lot of the cheese parts. I am not a big snacker which is why I very rarely share snack pictures on the blog. Sometimes in the afternoon I will grab a few baby carrots but I don’t actually like them. In fact, if I eat too many raw carrots, they hurt my stomach so sometimes I microwave them to soften them up. In between breakfast and lunch I drink tea though. This week it’s all about Raspberry Leaf tea. Even though I really don’t enjoy the flavor, I drink it for the powers of relieving PMS and menstrual discomfort. Does it work? I haven’t the slightest idea but I like to think it does something. I’m fairly new to Raspberry Leaf tea but I intend to keep it up just to test out the theories. I am back to eating apples with peanut butter most nights during the week now! Not Granny Smith though, I can’t return to those just yet but the Honey Crisp are working for me at the moment. 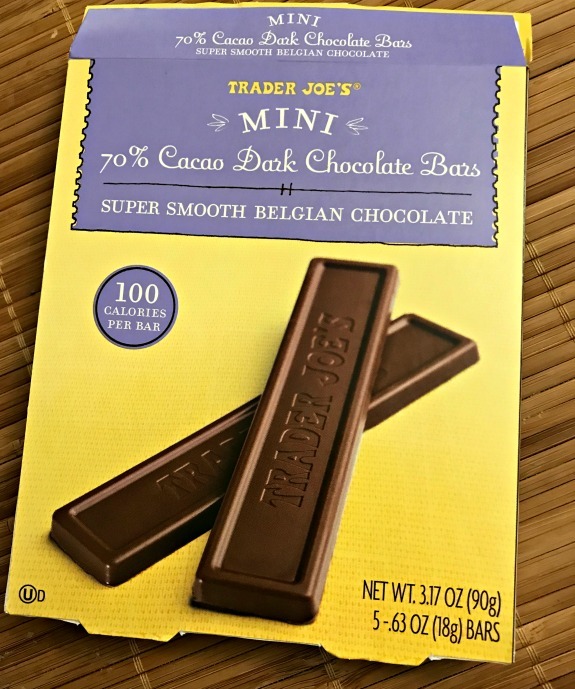 Oh, and last night I dipped one of these mini dark chocolate bars from Trader Joe’s in peanut butter. Perfect snack. 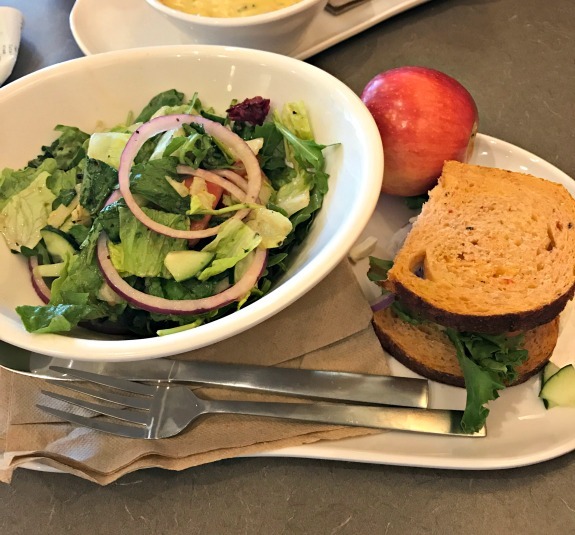 Be sure to visit Sprint 2 The Table for today’s What I Ate Wednesday! Are you a fan of fajitas? What kind do you usually order? 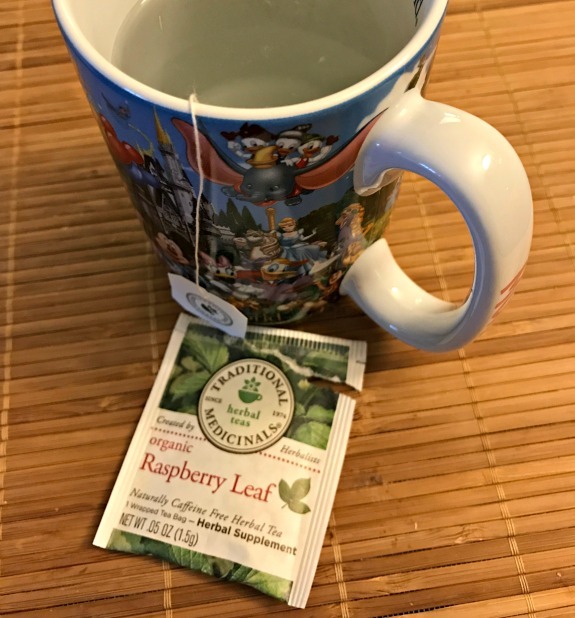 Do you drink Raspberry Leaf tea? Do you believe in the health benefits? Anyone else completely out of touch with their winter running gear? Do you think that maybe you need some new stuff for this coming season? What do you need? I drank raspberry leaf tea starting in the 2nd trimester of pregnancy because my midwife recommended it to ease any discomfort/cramping. I don’t know that it worked (hello prodromal labor for 4 weeks before delivering at 39 weeks) but maybe it does for others! Also, hello again – I’ve been reading for the past year (often on my phone in the middle of a long nursing session in the early days) but I’m only starting to comment on blogs again now that I am out of the pregnancy and new newborn stage! Alyssa recently posted…What’s a Millennial Mom To Do? Hello again for sure! I hope all is well! I do follow along on Instagram and see that cute little baby 🙂 I sure wish I had blog reading or a smart phone with texting at least when my son was a newborn. those days (and long nights) were certainly rough. Hope all is well! I love you pick two from Panera! You can get the best of two meals. Fajitas are such a fun dish to order because you get to make them exactly how you want at the table. Belgian chocolate is some of the VERY best next to German and Swiss chocolate. 🙂 And I don’t snack a ton, but I love tea and occasionally a mug of cereal for a snack. How do you usually cook your Jap potatoes? I used to microwave them and had one every single day but it has been awhile! I like them roasted! I dice them up as I do any other type of potato and roasted them in the oven. only thing I do notice is that they are done quicker than other potatoes. I really like fajitas! Shrimp ones are my favorite, but veggie ones with avocado are so good. It’s been a while since I’ve been out for Mexican food! I need new stuff for the season – a good vest being one of them! Interested to hear your review on the raspberry leaf tea! I heard drinking dandelion root tea or eating the supplements can help with PMS symptoms … Hasn’t worked for me but game to try something new! Sweet potatoes make every salad better! And LOL, I forget about clothes all the time, especially jeans for some reason. Ive tried Raspberry leaf tea and Im not sure it helps with PMS. But I actually think it tastes pretty good so sometimes I will drink it. I always forget about certain clothes that I havent worn in awhile! I never tire of fajitas… or any Mexican food, really. Good thing because that’s the majority of the food in SoCal! I should never visit your blog when I’m hungry because now I want fajitas and rice and beans. Mmmm, maybe I should convince the Hubby to go out for Mexican food one night this week.